Jason has been tattooing professionally since 1999. Starting in his home state of South Dakota, Jason has tattooed in Minnesota, Louisiana, and currently owns Neon Dragon Tattoo in Cedar Rapids, Iowa. Jason has traveled extensively to many conventions and guest spots and currently still travels regularly. 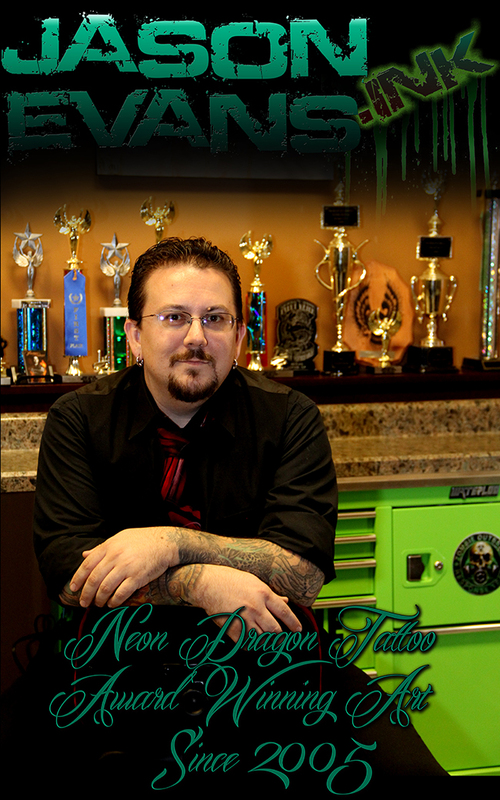 Jason not only provides his clients with great body art, but does so with a positive attitude. Jason does not do any anti-religous, racist, or hateful tattoos. Although no tattoo is too big or small, Jason prefers to do Traditional, Neo-Traditional, Asian, Color Realism, and anything Bold Color. Jason also excels in cover ups, doing many that seem impossible. with a detailed description of what you are looking to do including size and placement on the body and any photos or other information you would like to add. Copyright 2015 TattoosByJason. All rights reserved.